The first section of London's underground rail network opened in 1863 between Paddington and Farringdon. We all know that. Transport for London spent the whole of 2013, the 150th anniversary, telling us. But did you know that the first train ride on that route actually took place a couple of years before the public opening? And do you know where shovel first hit dirt during construction of that first line? If not, read on. 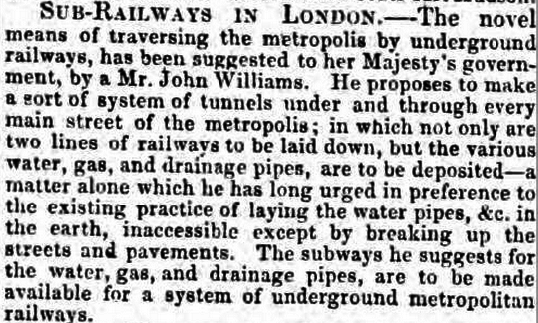 When was an underground railway first suggested? (C) The British Library Board. Over the next decade, many rival schemes were proposed. Most people agreed that London needed a subterranean railway to relieve surface traffic, but how best to do this, and how to raise the money? Charles Pearson remained at the forefront of proceedings and his influence was instrumental in gaining planning permission. Where did the very first spade hit dirt? Seymour Street is the old name for Eversholt Street. So the very first piece of engineering work ever undertaken on the Underground can, we think, be pinpointed fairly accurately to this corner. Following these preparatory works, the line was built by the cut-and-cover method. That is: the roadway was dug up to form a trench, which was then lined with bricks and roofed over. Many houses were also demolished to make way for the scheme. Three years after the first surface scratchings, the tunnel was complete. The Metropolitan Line first opened to the public on 10 January 1863. But others had ridden it first. Who was the first to ride on the Underground? It's generally asserted that the first trip along the Metropolitan line occurred on 24 May 1862, when William Gladstone and his wife travelled the route in an open-top carriage (below). It's not true, though. 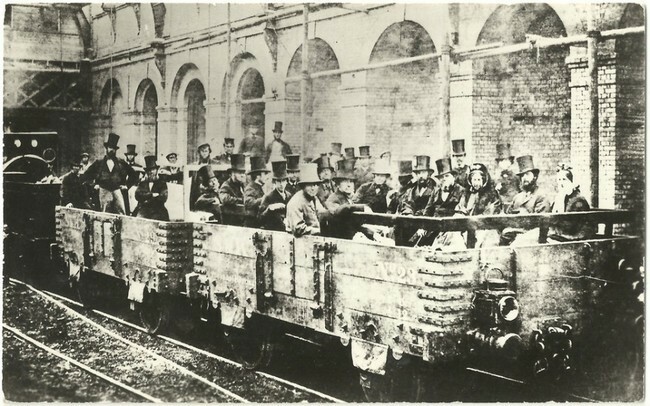 The first reported journey through London's first subterranean railway took place on 28 November 1861, more than half a year before the Gladstones' jaunt. A group of unnamed journalists boarded a train at Great Western (Paddington) and took a short run to Chapel Street (Edgware Road). 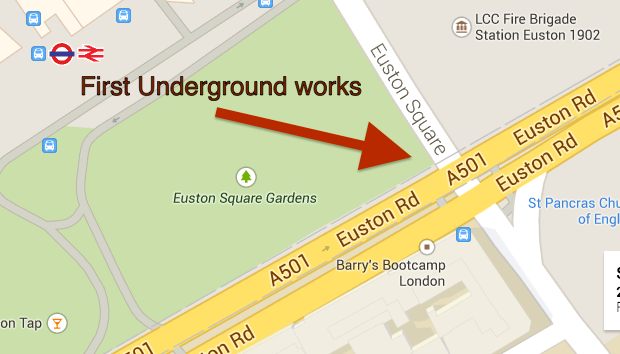 The delegation then walked some distance through the tunnels before boarding again near Euston Square, bound for King's Cross. Said one adjective-happy reporter: "The tunnels, instead of being close, dark, damp, and ill-smelling passages, are wide, spacious, clean, and excellently well lit, resembling more well-kept street by night than a subterranean passage through the very heart of the metropolis". Who was the first person to be killed on the Underground? As with any Victorian engineering project, numerous workers lost their lives during the construction of the underground. Six men were killed, for example, when a viaduct near Ladbroke Grove collapsed in 1862 on the future Hammersmith and City line. The first person to be slain by human hand however was James Driscoll in May 1862, several months before the Metropolitan Railway opened. Driscoll was working on one of the great iron girders spanning the line near King's Cross when he fell into dispute with fellow worker Edward Gregory (34). The pair traded blows before Gregory "took hold of Driscoll, and flung him with great violence into the cutting below, a distance of fifty feet". Driscoll initially survived the fall and was taken to the Royal Free hospital suffering compound fractures to both legs (the bones "pounded into 15 or 20 pieces") and multiple wounds to the upper body. He later died of shock following amputation. During the subsequent trial, Gregory was found guilty of manslaughter, becoming the first person to be convicted of taking another life on the nascent underground network. Who was the first person to get a bollocking for writing rude words on the Underground? Another report states that "When he was detected he burst into tears and said it was his first offence". After fining Williams, Judge Mr Yardley naively said that "no doubt the publicity the case would receive would be effectual in preventing such conduct in future". And no one ever graffitied the Tube again. The British Newspaper Archive was invaluable in compiling this article.